If you are gluten free I am sure you have searched for the perfect pound cake recipe. 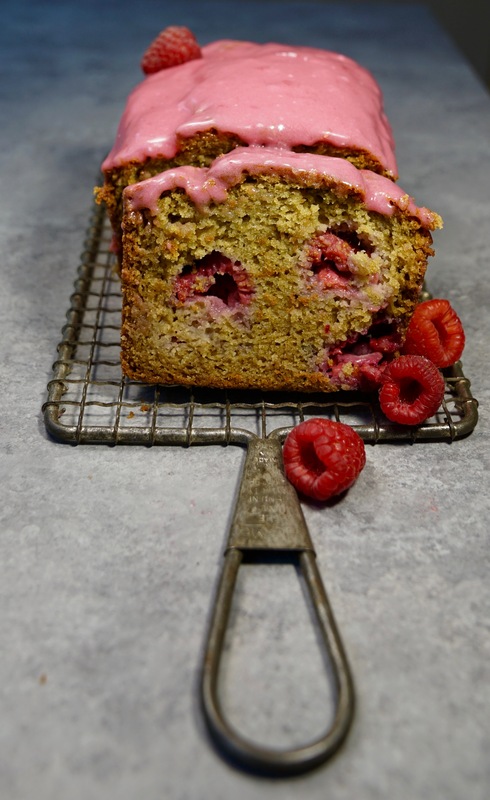 I am so excited to share this new lemon raspberry cake with you all! It is everything you dreamed of: light, spongy, citrusy, naturally sweet, balanced, super easy and fast to make and the glaze is dreamy. Thanks to Maskal Teff™ for sponsoring this post!! All opinions are my 100 % my own. Thank you for continuing to support the brands who make Vanessa Musi possible! When Maskal Teff™ reached out to me and asked me to create a Master Pound Cake recipe using their amazing teff flours, I was dreaming up ways to highlight their Ivory Teff four which is a fascinating ancient grain that has so many health benefits you wouldn’t believe it. I had baked with brown teff flour before but had not explored Ivory teff flour until my husband Erin and I discovered the most amazing Ivory Teff tortillas in the super market when we decided to go gluten free and that is how I found Maskal Teff™. I wanted to create something new and I was inspired by the French Pastry Cakes de Voyage (travel Cakes) made with almond flour. The best recipes are those you can adapt and personalize don’t you think? Teff is a nutritional power horse! It is an ancient grain, loaded with fiber, protein, all 9 essential amino acids, rich in calcium and iron and really a great ancient grain to add to your flour repertoire. Especially when you want to add more nutrient dense flours to your recipes. It bakes very well! Here are my tips: (note all opinions are mine) to use teff in your recipes use only half of the what your recipe calls for of flour: add in lighter flours like I did: such as almond flour, a gluten free flour blend (I made my own: recipe below) or use spelt or a starchy flour to lighten the teff flour. It also bakes best with moist ingredients such as buttermilk, yogurt, coconut milk, olive oil. Please note: all opinions are my own. Grease a medium size loaf cake pan and line the bottom with parchment paper. Sift almond flour, teff flour, tapioca flour, baking powder + salt. In a mixer with a whisk mix egg, vanilla, maple syrup, sweetener of choice at medium speed until fluffy (it won’t double in volume) add coconut oil and mix until combined. Add buttermilk or almond milk just to combine. Add the sifted flour mix and combine. Add the zest of choice or nothing and mix. Add the add in ingredients of choice (reserve a few to put on top of the cake), mix batter lightly with a plastic spatula. Pour batter onto prepared cake pan. Mix in a bowl with a whisk until combined: check consistency it might need more liquid or thicken with more coconut milk powder. You know when you hit a pot of gold? That is what I felt creating these from scratch. 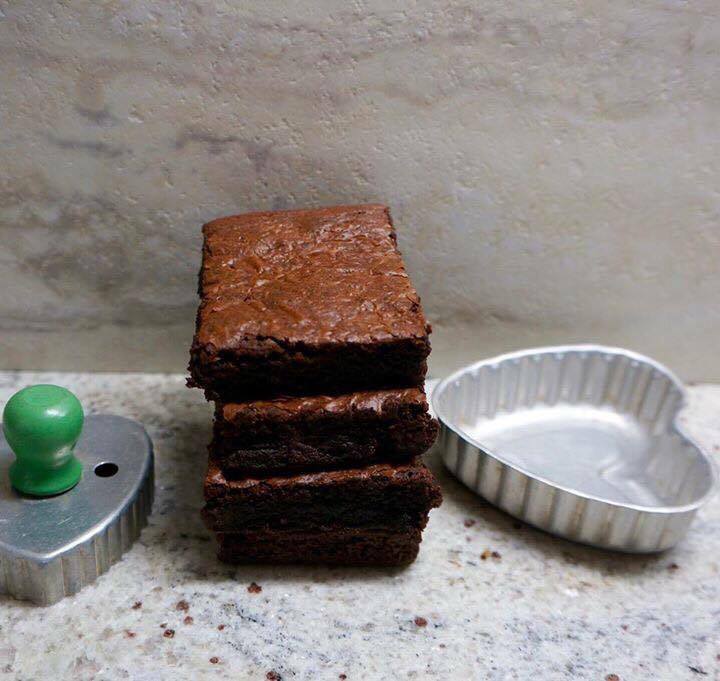 I wanted to develop a chewy (better than boxed brownie) that has a crackly top and is wholesome and #lowsugar, using only premium ingredients. I literally made hundreds of brownie recipes to develop these. Note: These brownies are about 1 inch thick, I suggest you get the ⅛ baking tray which is lovely to bake with you can find it on Amazon. Lightly grease an ⅛ baking tray or an 8 inch square brownie pan with parchment paper. Pre-heat oven to 345 F.
Melt oil in microwave or in a pot. Pour into a large bowl, add Stir Sweetener, mix with a whisk by hand (mixture will look very dry and crumbly (don’t worry). Add egg + vanilla, mix well. Add sifted cocoa or cacao with salt and flour. Mix until combined. Batter will be quite thick. With a rubber spatula fold in half of the chocolate chunks (reserve the rest to sprinkle on top). Put batter onto the prepared tray. With an offset metal spatula level the surface. Sprinkle the rest of the chocolate and sprinkle the Maldon Salt on top. Bake for about 15 mins (in convection oven/ normal ovens take a bit longer and please note: baking times vary depending on your oven, pan, cocoa or flour used), check with a toothpick: it should come out with a moist crumb, never dry or too wet. Note: brownies will set as they cool. Remove from oven and cool for 1 hour. Remove brownies from pan by lifting the paper. Cut into 9 or 12 pieces with a sharp chef's knife or serrated knife. Brownies keep stored in a plastic container such as a recycled washed salad container for about 3 days optimally. Or freeze for longer shelf life. This is one of my new favorite go to Muffin recipes of 2016 : so simple, so easy, adaptable and balanced. I was lucky to find a new sweetener I really like. You know the saying: when the student is ready, the teacher appears, well this was similar in the sense that after 23 years I was so ready to find a sweetener that fulfilled all my needs: and quite honestly I had used them all and they all had their imperfections. I wanted something naturally sweet, with benefits, easy to use, easy to love: no after taste, no weird ingredients, no adapting recipes, no bitterness. Something better than sugar both for health and in baking: same texture, taste and overall chemistry. So these killer Muffins are made with Stir Sweetener a coconut sugar blend which I love because it has 37% fewer calories than sugar, has a gram of prebiotic fiber per serving, is a 1:1 replacement for sugar, is suitable for diabetics and tastes so much better than any sweetener I have used in 23 years. In a medium bowl, whisk together the flour, salt, baking powder, and lemon zest (if using). In a separate large bowl, mix together the egg, vanilla, Stir Sweetener, yogurt, and oil. Add the dry ingredients and the milk (alternating) to the wet ingredients, mixing to combine with each addition. Fold in the blueberries with a gentle hand. Combine the cinnamon, salt, lemon zest, flours, salt and Stir Sweetener in a small bowl. Add the melted butter and mix to form clumps. Scoop the batter into muffin cups or a greased muffin pan until ¾ full. Top with the streusel. Bake for about 20 minutes (start checking at 12 minutes) and remove when muffins are golden brown and the berries are bubbling with juice. Let cool, then remove muffins from the pan and onto a cooling rack or perforated tray. These muffins keep max for 2 days in a plastic container such as a recycled pre-washed spinach container. Seriously. I am NOT exaggerating. We all have a claim to fame recipe for sure. But really I have made many and have gone through my fair share of chocolate chip cookie recipe testing for bakeries and for my personal classes, even for Starbucks Mexico. I always dreamed of a “killer” chocolate chip cookie that I could eat. I imagined the chewy but crispy texture and the perfect balance of sweetener, salt, chocolate.. And I was challenged by the fact that these had to be: gluten free, vegan and low sugar. My sister says I was born savoring the world: and every day this makes more sense to me. So to make a LONG story short and not dwell into too much information or details and get straight to the recipe/ the way I like blogs to be. I have not been eating gluten, sugar or dairy (or at least striving to) due to my psoriasis and a leaky gut I developed after my hip replacement and so many antibiotics. Did you know that a leaky gut is connected to auto inmune disorders? I have been seeing the documentary called Betrayal which I highly recommend. This inspired me to create more gut friendly recipes: gluten free, (some grain free) dairy free, vegan, low sugar, soy free for so many people who are have auto inmune disorders, have food allergies or have gut problems. After 10 recipe trials, a lot of wasted premium ingredients, so many greasy and flat cookies thrown into the garbage, major baking frustration (the kind that does not let me sleep). I was determined to nail this recipe no matter what. More than a craving this was and is my ultimate obsession. And after my Bday trip to NYC last week (and tasting Levain Bakery’s cookies: which sadly were not my favorite at all: way too sweet and I felt terrible after eating just a small piece) I came home and rushed to my test kitchen to challenge the satus quo. I hope you’ll love them as much as I do: because I do believe this recipe is worth GOLD. I couldn’t stop taking photos and really feel ready for my cook book!! Also please forgive my delay in updating this blog! I spent literally 21 months traveling to almost 30 cities: teaching over 3,000 bakers from NYC to Cancun: and doing all the logistics of the classes by myself! A MAJOR project. So after that intensity and having 2 websites: I made some huge decisions. 1. I closed my group on Facebook (that took soo much time out of my baking) 2. I decided to change ALL this website (new website coming in 2017) and I will have only an English website and focus all my energy into a blog that is consistent and strong 3. I hired a PR firm and we are working on my healthy baking school and a few projects that I am so excited about. 4. I began working with the new sweetener featured in this recipe that I am IN LOVE with: it’s so easy to use, bakes so well, has NO after taste, is naturally sweet, has a great shelf life and is low glycemic. So these killer chocolate chip cookies are made with Stir Sweetener a coconut sugar blend which I like because it has 37% fewer calories than sugar, has a gram of prebiotic fiber per serving, is a 1:1 replacement for sugar, is suitable for diabetics and tastes so much better than any sweetener I have used in 23 years. Stay tuned for more exciting recipes! This recipe was inspired and adapted a ton from the original chocolate chip recipe from Leila Arcieri, CEO of Stir Sweetener. THE BEST WHOLESOME CHOCOLATE CHIP COOKIES EVER! Prepare cookie dough preferably several hours before (please don't skip this stage so that cookies can hydrate, and maintain their shape when baking, if not they will expand!). In a small bowl: whisk: flours, salt and baking soda. In a bowl: mix coconut oil, Stir Sweetener, flax egg, vanilla with a whisk by hand. Add the flour and mix until combined. Add the chocolate and mix well. Shape cookies with a #24 scoop and place onto a lined cookie tray with Silpat (I use a half sheet perforated baking tray/ it bakes better, faster). Place cookies with enough space in between. Do not flatten. Freeze for 1 hour or refrigerate for at least 4 hours, alternatively you can shape cookies into balls (with this scoop) and put into ziplock bag) and freeze or chill over night then bake as is the next day. Bake in a preheated oven (convection preferably) at 345 F (170 C). Bake for aprox 8-10 mins it will depend on your oven, baking sheet, how thick the cookies are, and how chewy/ crispy you want them. Remember: they will continue to bake as they cool on the baking tray. So you can test one out to see the exact time. I like mine chewy and believe these must be so. Cookies must be golden, soft in the middle, crispy on the outside edges. Remove from oven and let cool for about 10 mins on the tray. Remove cookies with a cookie spatula and if you take out the Silpat your perforated tray becomes a cooling rack! Let cool completely and then store in a cookie tin or a recycled salad container (you know the one in the Supermarkets that has pre washed spinach). Cookies will keep very well up to 4 days optimally at room temperature. Enjoy!!! Please let me know when you make them! Share the love and spread the word! Happy Thanksgiving friends! Love you all! Hey Buddy!, I found this information for you: "THE BEST WHOLESOME CHOCOLATE CHIP COOKIES EVER". Here is the website link: https://vanessamusi.com/the-best-chocolate-chip-cookies/. Thank you.